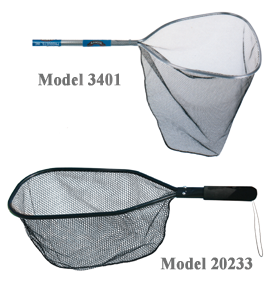 Models 20231 through 20237 feature black anodized Alumaguard hoops with netting on the inside of the hoop to protect nets from being torn by rocks and other foreign objects. These nets feature soft 3/16″ mesh netting that is shallow so fish can be cradled, unhooked and released with minimal damage. 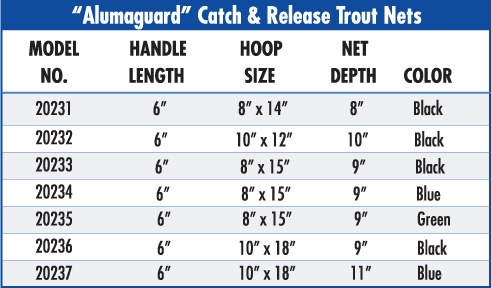 Models 20236 and 20237 are perfect for the Rocky Mountain region, where trout are bigger. These nets also make good live well nets.